Home GoDaddy Thank You, GoDaddy! 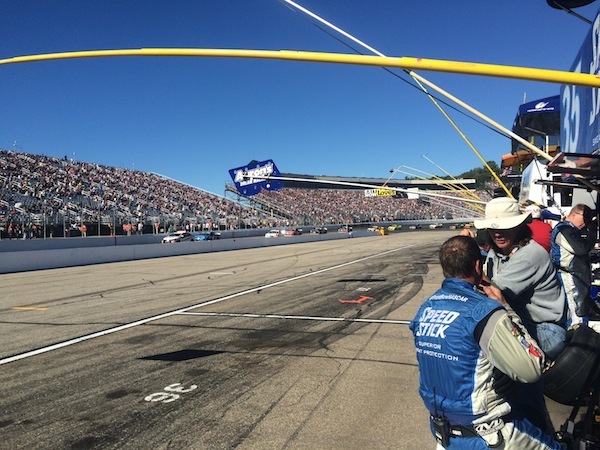 Despite living in New Hampshire for the majority of my life (until I was in my 20s), I had never been to the New Hampshire Motor Speedway (NHMS). In fact, I had never been to a NASCAR or other auto race until yesterday. 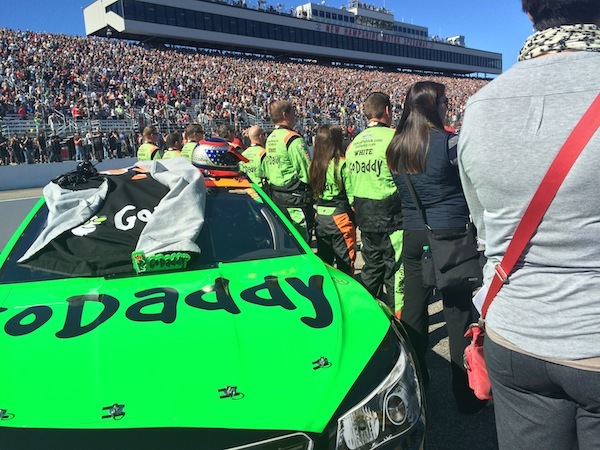 I want to give a big “thank you” to GoDaddy for inviting me to watch the GoDaddy NASCAR team at the Sylvania 300 at NHMS. It was a memorable event, and I sincerely appreciate the invitation they extended to me and a friend of mine. I want to share some of the photos I took during this unforgettable day. 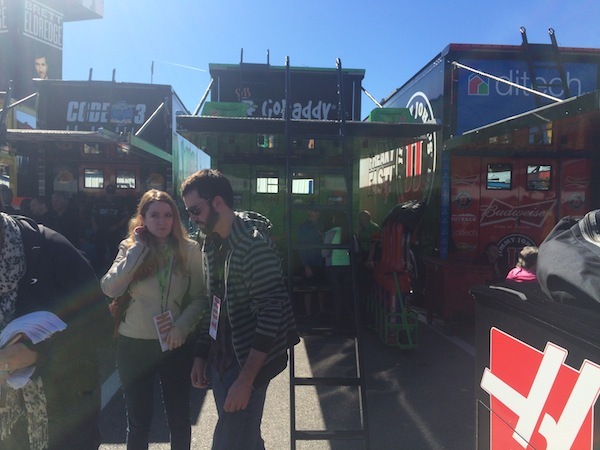 We arrived early and had a chance to look around the GoDaddy team hauler. The truck carried the GoDaddy cars, and it was full of extra parts used on the GoDaddy car. The team was setting up and making adjustments while we chatted about the race and jobs of the team members. Everyone we met was friendly and gracious, despite the fact that we were hanging out in their “office” on race day. 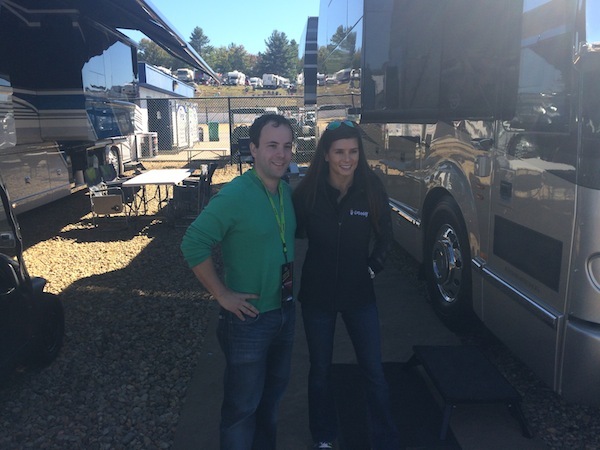 After taking a tour of the hauler, we were introduced to Danica Patrick outside of her RV. She spoke with us for quite some time considering it was race day, she she answered some questions for us. We were also able to meet her two dogs. Danica took several photos with us and seemed relaxed and excited for the race. Next up was the pre-race driver and crew chief meeting. This in and of itself was a unique experience, as we were standing behind all the race car drivers before the race. 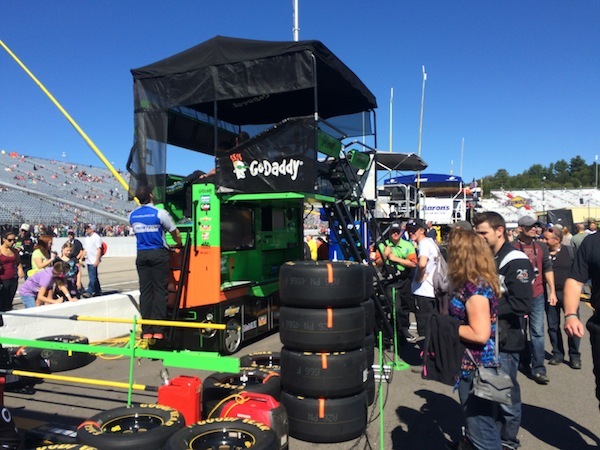 Shortly after the meeting concluded, we got to take a walk around pit row, and we saw the GoDaddy pit crew team and their pit row setup. We spoke with one of the guys who lifted the huge gas cans and filled Danica’s car during her very short pit stops. 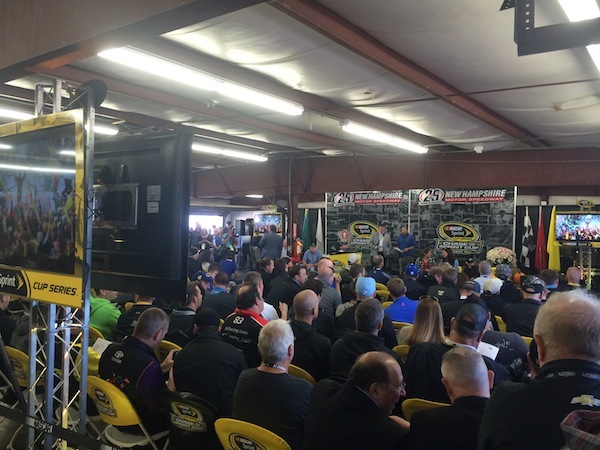 We had a big lunch catered by the Stewart-Haas Racing catering team. They had lobster tails, steak, chicken…etc. They did not mess around when it came to eating, and they showed warm hospitality for their team members and friends. The next part of the day was one of the more special aspects for me. We got to see the race car just prior to the race, and we had a couple of additional photos taken with Danica (in full race gear). We stood in line next to the GoDaddy car as the national anthem was sung and watched two F-15 fighter jets streak by overhead. Their screaming loud engines foreshadowed the buzz of the race cars blazing around the track. 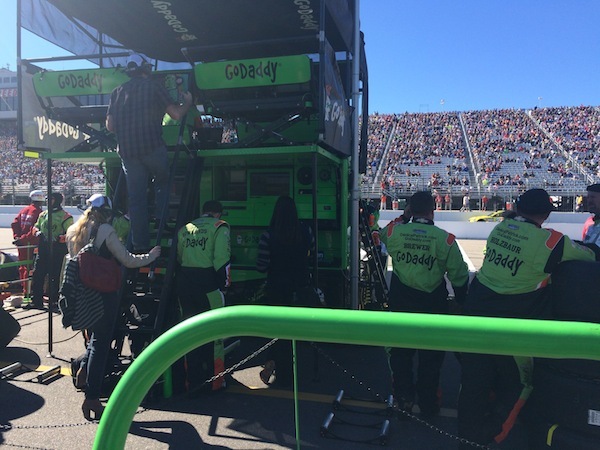 During the race, we sat behind the GoDaddy pit crew as well as in the tower that contains much of the equipment. We were sitting directly behind the crew chief and some of the other team members who were monitoring their computers and the communications. The GoDaddy team provided us with headphones that had a live feed of Danica’s communication with her team during the race. At one point during the race after a caution, one of the members of the pit crew team invited me to the front of the team’s pit area for the race restart. It was thrilling to almost be a part of the race. Although the race didn’t end well for Danica’s team yesterday, I had a once in a lifetime experience I never imagined having. I want to give an additional thank you to Martha Brown and the entire Stewart Haas Racing team for their warm hospitality. They treated us like we were special guests, and I really appreciated that. I also want to give GoDaddy’s Paul Nicks and Brian Kleiner a thank you. Brian was at the race with his father-in-law, and we had a good chance to talk about the domain business. I even made him an offer for a pair of domain names the company acquired earlier this year… we shall see what happens with that! Wow! Up close and personal… nice, Elliot. That’s the way to see a NASCAR race. Awesome day! How cool is that?! Thanks for sharing your experience here, Elliot. What a wonderful experience for you! You’ve met a great lady and team that never gives up. You are a lucky dog!!! Very cool man! Thanks for posting up the pics. That must have been amazing. Great pictures. These pics are amazing, good work Elliot.